Stephen Hawking is one of the greatest minds of our time and he has lived 50 years with ALS. Stem cell treatments have a proven history of treatment of ALS in both animal and human studies. 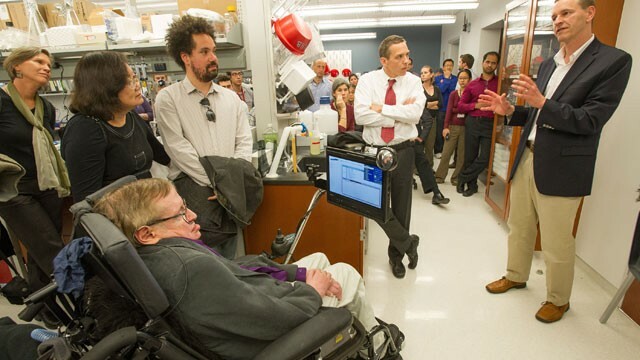 Stephen Hawking toured a stem cell laboratory Tuesday where scientists are studying ways to slow the progression of Lou Gehrig’s disease, a neurological disorder that has left the British cosmologist almost completely paralyzed. After the visit, the 71-year-old Hawking urged doctors, nurses and staff at Cedars-Sinai Medical Center to support the research. Hawking recalled how he became depressed when he was diagnosed with the disease 50 years ago and initially didn’t see a point in finishing his doctorate. But his attitude changed when his condition didn’t progress quickly and he was able to concentrate on his studies. “Every new day became a bonus,” he told a packed room. Cedars-Sinai received nearly $18 million last year from California’s taxpayer-funded stem cell institute to study the debilitating disease also known as amyotrophic lateral sclerosis. ALS attacks nerve cells in the brain and spinal cord that control the muscles. People gradually have more and more trouble breathing and moving as muscles weaken and waste away. Diagnosed at age 21 while a student at Cambridge University, Hawking has survived longer than most. He receives around-the-clock care, can only communicate by twitching his cheek, and relies on a computer mounted to his wheelchair to convey his thoughts in a distinctive robotic monotone. A Cedars-Sinai patient who was Hawking’s former student spurred doctors to invite the physicist to glimpse their stem cell work. “We decided it was a great opportunity for him to see the labs and for us to speak to one of the preeminent scientists in the world,” said Dr. Robert Baloh, who heads the hospital’s ALS program. During the tour, Hawking viewed microscopic stem cells through a projector screen and asked questions about the research, Baloh said. Cedar-Sinai scientists have focused on engineering stem cells to make a protein in hopes of preventing nerve cells from dying. The experiment so far has been done in rats. Baloh said he hopes to get governmental approval to test it in humans, which would be needed before any therapy can be approved. Despite his diagnosis, Hawking has remained active. In 2007, he floated like an astronaut on an aircraft that creates weightlessness by making parabolic dives. Space exploration is important “for the future of humanity,” he told the audience. And he gave some advice: Look up at the stars. Stay curious. “However difficult life may seem, there is always something you can do and succeed at,” he said. Doctors don’t know why some people with Lou Gehrig’s disease fare better than others. Baloh said he has treated patients who lived for 10 years or more. “But 50 years is unusual, to say the least,” he said.